Distinct functions have been hypothesized for the creatine kinase (CK) enzyme catalyzing the reversible transfer of the high-energy phosphate group of ATP to creatine. In muscle cells, two CK isoforms might mediate (i) temporal energy buffering to maintain ATP homeostasis and (ii) energy transport from mitochondria to myofibrils via the “phosphocreatine shuttle” mechanism. Here we investigate the relative importance of the two roles using a computational model . Model simulations predict a contribution of CK to the net transcytosolic energy transport of less than 1/3. The model is validated on experimental data from two scales: kinetic parameter measurements on the enzyme level and response times of oxidative phosphorylation in whole cardiac muscle. To account for possible inaccuracies in the 22 model parameters, we sample a Bayesian ensemble of parameter sets which allows us to set confidence regions on model predictions. In this ‘sloppy’ modeling approach , the likelihood of a parameter combination to be included in the ensemble is proportional to its likelihood to predict the data. We use prior information on single parameter values from enzyme kinetic measurements to constrain them within their measurement errors. From the ensemble, we predict a contribution of CK to the overall energy transport of 15±8% (mean±SD). The CK system damps the pulses of ATP hydrolysis of 3765 μM*s-1 during cardiac systole about 20 fold. 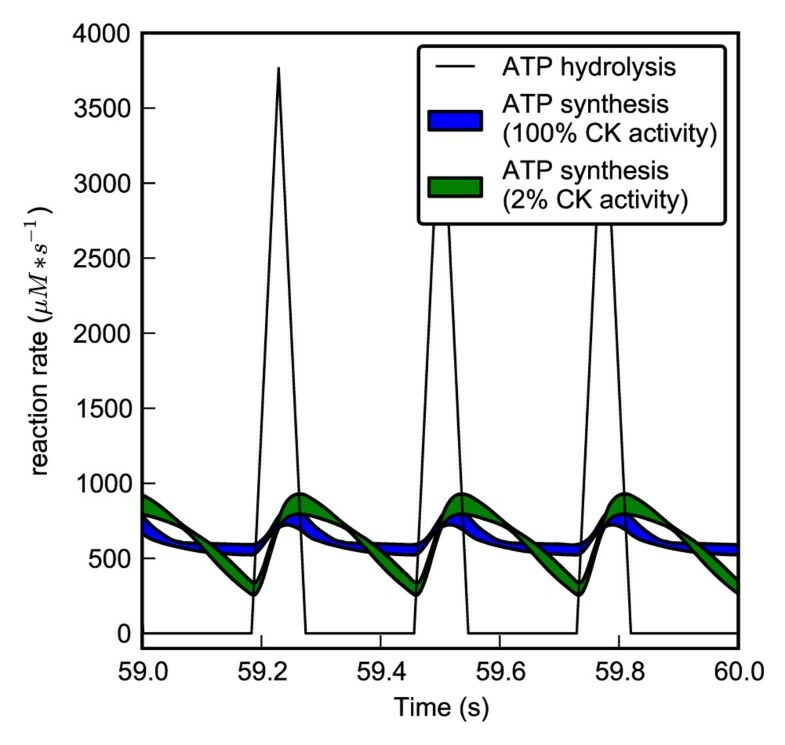 CK inhibition by 98% increases the amplitude of ATP synthesis from 215±23 to 566±31 μM*s-1 (see Figure 1). 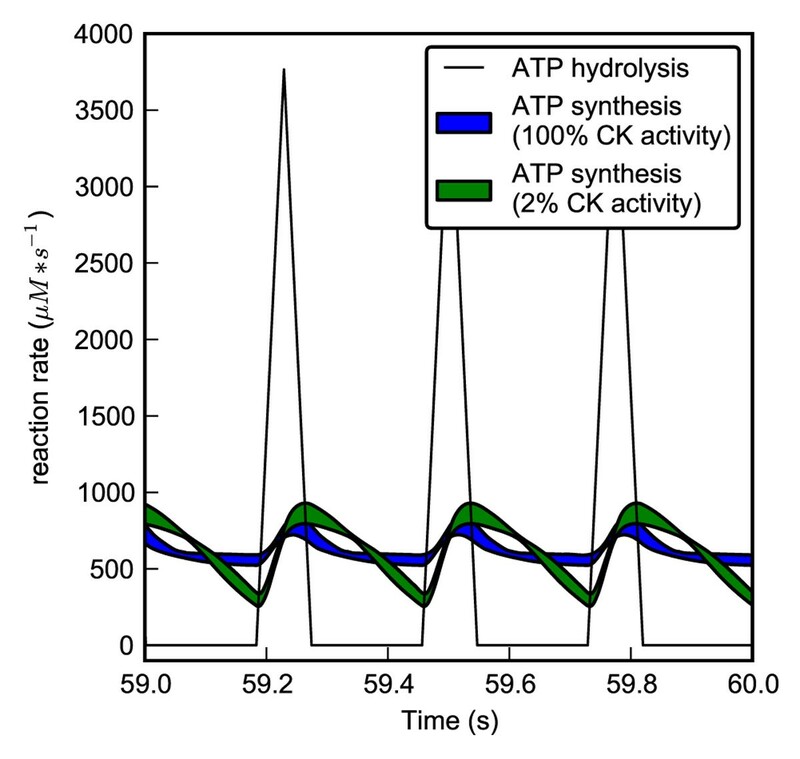 Prediction of ATP synthesis rate for full CK activity and CK inhibition by 98%. The plot shows the steady state values of the last second of a simulation over 60 seconds. Note that the plotted regions show the 95% confidence interval between upper and lower bound of the simulation of a parameter ensemble containing ~500 parameter sets. Model input is a forcing function simulating pulsatile ATP hydrolysis in the beating heart, plotted in black. Our findings clearly support the hypothesis that CK acts as a high capacity temporal energy buffer damping energy peaks rather than being an essential energy transport system.